De-horning days on the rhino ranch of Chishakwe bring up a welter of emotions. There's the need for a professional focus to make sure the job is done right; there's the hot claustrophobia of flying in one of the spotter planes, sweeping the arid Zimbabwe veld for black and white rhino. Then there's the worry of making sure the rhinos lives are not put at risk during the de-horning process - not mention maintaining the respectful wariness that a 8,000lb wall of muscle commands. But there is also a sense of awe: "Being able to see rhino up close and touch them is thrilling and also humbling," says Lisa-Jane Campbell of the Chishakwe ranch, part of a group of conservation ranches found in the Save Valley Conservancy. The task of de-horning these powerfully iconic top-grazers of the veld is one that has, sadly, become all too common. As poachers step up their remorseless slaughter of rhinos, to satisfy growing demand for rhino horn, strategies such as de-horning have become an essential part of the conservationist's toolkit. The problem is that rhino horn has become more valuable than gold or diamonds - at some $45,000 per pound - thanks to malicious and recently-refuted claims of its medicinal value in traditional Asian remedies. That heightened demand has had stark consequences for the recovering rhino populations of southern Africa - Zimbabwe alone has seen 300 dead rhinos because of poaching, over the last 5 years. It is to help stem this rising tide of loss that conservation ranches in Zimbabwe have turned, reluctantly, to the task of putting the rhino horns out of the reach of the poachers - by de-horning them. 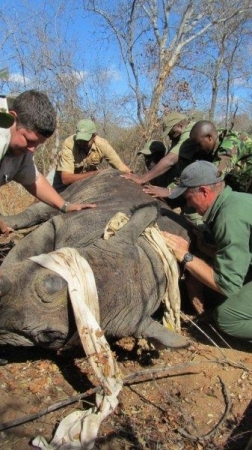 This radical approach has been adopted nationwide, as part of a multi-pronged strategy to conserve Zimbabwe's rhinos. It includes scouting patrols on the look-out for poaching activity, a crack anti-poaching unit to confront and arrest poaching gangs, as well as efforts to make the growing of rhino populations more beneficial to local populations. But that strategy also requires the unique blend of skills and talents that the vets, scouts, spotters and ground crew bring to the job of de-horning rhinos - the largest of mammals, outside of the elephant, to be found roaming the African veld. At the Save Valley conservancy, de-horning is done by the LowVeld Rhino Trust. It has responsibility for conserving rhinos across 1.3 million acres of southern Zimbabwe, and does its work here over a three-week period. As well as de-horning, the team takes the opportunity to count the rhinos, assess their health, and mark them for ongoing monitoring efforts. But first the team must find their target - which means taking to the air, first of all in a spotter plane. 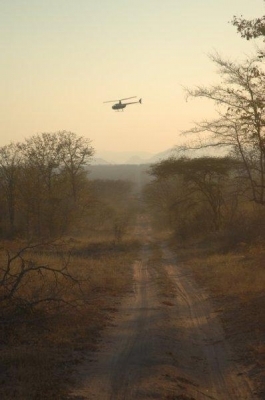 "A small spotter plane flies over the area in transects to find the rhino. When they find it they call in the chopper which will be standing by. It is small and stuffy and you fly around at low levels for hours. If you think you are not prone to air sickness, an hour or so of that will change your mind!" says Chishakwe's LJ, who has been on several such operations. Then the hard work begins. "The rhino is darted from the chopper," continues LJ, "while the ground crew wait nearby and once the rhino is darted they drive in. 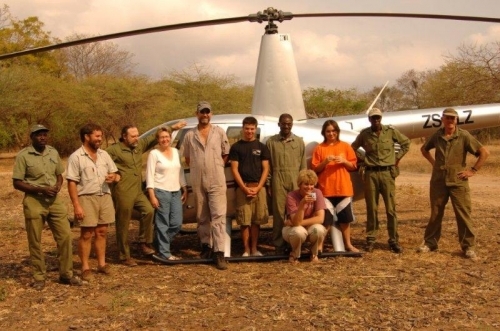 The chopper lands as close as possible and the vet (responsible for the darting) comes to administer to the unconscious rhino." Dealing with the prone rhino means moving fast, to ensure it can breathe properly, and does not overheat. "It is very important for the rhino to be kept cool (they are sprayed with a mist) and they like to keep them kind of propped-up, so that they are not lying heavily on one side, in case the circulation is affected." The rhino is also blindfolded to avoid distraction which could stress the animal. 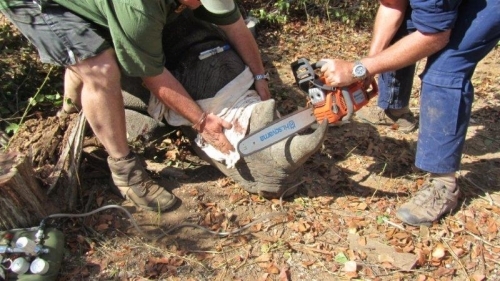 Whilst a chainsaw is used to remove the upper horn, leaving a 'bed of horn' to ensure that no pain is caused, others work to mark the rhino for future tracking. "Grooves are cut in their toe nails to make our trackers work a little easier ... at least for a little while until the nail grows out. They then notch and tag the ears so that individual rhino are unmistakable. 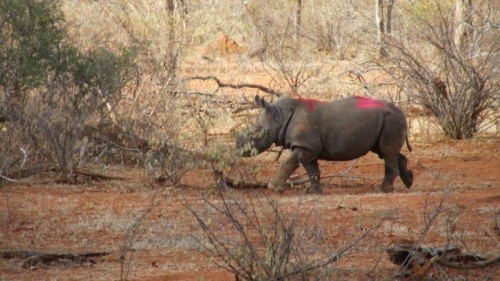 Finally they mark the rhino with paint so that they can spot them easily from the air during the ops period." The need for speed is paramount for the safety of the rhino - but also when the team finds itself being watched form the sidelines. "Once, when I was with the ground crew, they had darted a half-grown calf and the mother was not far away. We were in thick Mopane forest and the spotter plane was flying around in circles overhead to keep an eye on where the mother was. It was really rather nerve-wracking having them tell us that she was hovering on the outskirts of our clearing all the time; just out of sight for us." That's when the recommended procedure is to keep one eye on the work-at-hand - and another marking out a tree to sprint for, in case the mother decides to get aggressively maternal. "I managed to spot one with a sideways branch I thought I could get on to," continues LJ. "Luckily everything went smoothly and she did not charge." It was only after the 'op' was completed safely, and the team were chatting about that their close escape that they realized things could have gotten messy. "It turned out we had all pegged the same tree!" So far the de-horning operations have been a success for the Chishakwe rhinos - none have been lost as yet to horn-poachers, although neighbors have not been so lucky. 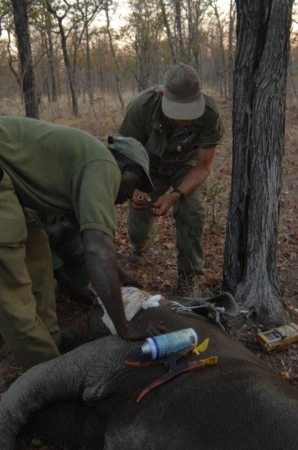 The de-horning process also does not appear to have caused problems among the resident rhinos - and may even have reduced injury among the boisterous males. "One positive effect is that bulls fighting would not inflict as much damage on each other," said LJ. This relative success may only be a stop-gap measure. Poachers have been known to kill rhinos even for the stub of the remaining horn. While demand for horn continues to grow, these sort of anti-poaching measures may not, in the end, be enough. The real solution, says LJ, is to slay the myth of rhino horn as being of medicinal value. "The demand for horn drives the price and thus the poaching. There does not seem to be an end in sight, bar extinction of rhino - unless something can be done to address the demand side of the equation." "Rhino are not dying because their horns have valuable medicinal qualities which are used in Traditional Chinese Medicine. It has been proved, on more than one occasion, that their horns have no more medicinal value than our own finger nails. They are dying because some people mistakenly believe rhino horn to beneficial to them. These people pay a lot of money for something that cannot help them." Perhaps once that message finally gets through, the de-horning teams can be disbanded - and the rhino can once again sport their magnificent horns with pride. If you would like to find out out more about rhino conservation, and perhaps help with donations and raising the rhino' profile, look out for World Rhino Day 2011, Thursday 22nd September. Check out these links for more information - World Rhino Day (Facebook), SavingRhinos.org, Chishakwe Ranch. Interviewed and written by Martin Leggett.